Following fast on the heels of Mojang's first console mini-game — Battle — is another competitive arena game mode, but this time with a little bit more polish and a lot more fun. Rather than trying to badly emulate the highly niche and wonky PvP that is popular on big Minecraft servers, Tumble takes all of the best elements of one of Minecraft's oldest existing minigames, polishes them and presents it all in fast-paced package. Where Battle was something of a disappointment, Tumble plays to Minecraft's strengths and manages to offer something to console players that is unique and fun. The idea behind Tumble is very simple — players start on a layer of dirt over a pit of lava and have to try to be the last player standing. Using shovels or snowballs, they try to outmanoeuvre their foes and dump them into the soup while avoiding the same grisly fate. If that sounds familiar, it's because it's basically the same concept as the Spleef minigame, which has been around in various forms for ages now. Tumble comes with the polish and craftsmanship of expert creators, and it doesn't feel so much like an imitation as an evolution. 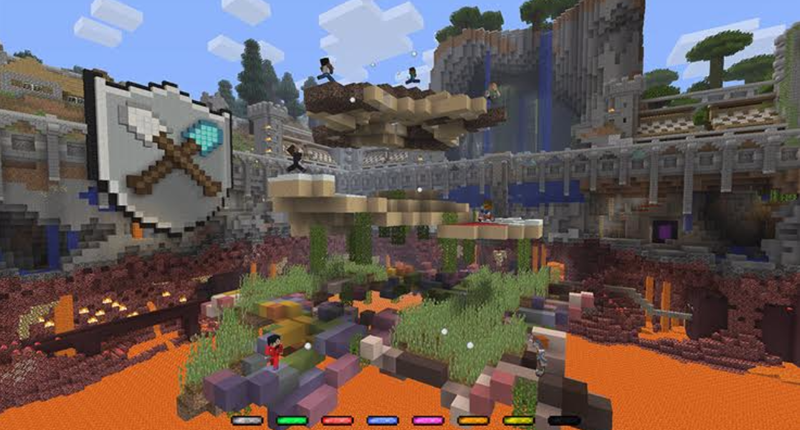 There are many different arenas that take advantage of all of Minecraft's varied biomes, giving players the opportunity to unceremoniously dump each other into molten rock from all sorts of terrain. 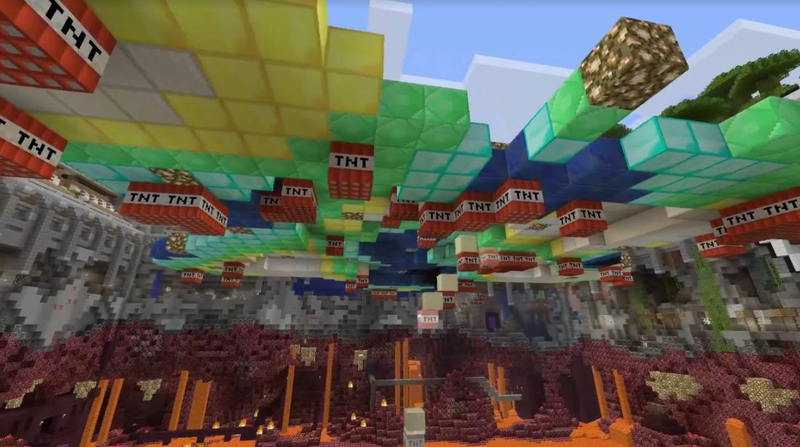 While there isn't a whole lot of strategy involved with Tumble — the best tactic seems to be running and hiding while other players eliminate each other — there are ways that good players can distinguish themselves, and that's where a lot of the fun comes in, especially for veteran Minecrafters. By avoiding soul sand and cobwebs, or by making use of slime blocks and jack o'lanterns, you can gain an advantage over opponents who don't make good use of terrain. For the most part though, Tumble plays a lot like a Mario Party minigame — hectic, often arbitrary, alternatively frustrating and fun. Tumble isn't going to develop into any sort of massive competitive scene or sell new players on Minecraft all by itself, but it's a free addition to an already robust game. And unlike Battle, it feels like it was designed to played in Minecraft. Tumble works great as a palate cleanser or with a close group of friends. Given the incredible attention to detail here, I hope Mojang gives us more like Tumble in the future.